WordPress is undoubtedly one of the most used and popular CMS (content management system) used for a variety of niches such as personal blogs, business, corporate, e-commerce, community and much more. WordPress is extremely flexible and has become more and more user-friendly over the years, which largely explain the increasing popularity. In fact, we can read in a new report from W3Techs that WordPress is now used by 59.2% of all the websites whose content management system W3Techs keep track of. This is 26.6% of all websites. Which is a pretty outstanding statistic. If we’re talking different uses we can use basically WordPress for, let me briefly say; Everything. It’s no understatement, it’s facts. WordPress has evolved from a rather insignificant blog platform into a powerful CMS used by millions of users to create a great online presence, and it doesn’t matter if you write a personal journal, or run a community site with thousands of users. WordPress is the platform that most people undoubtedly prefer. 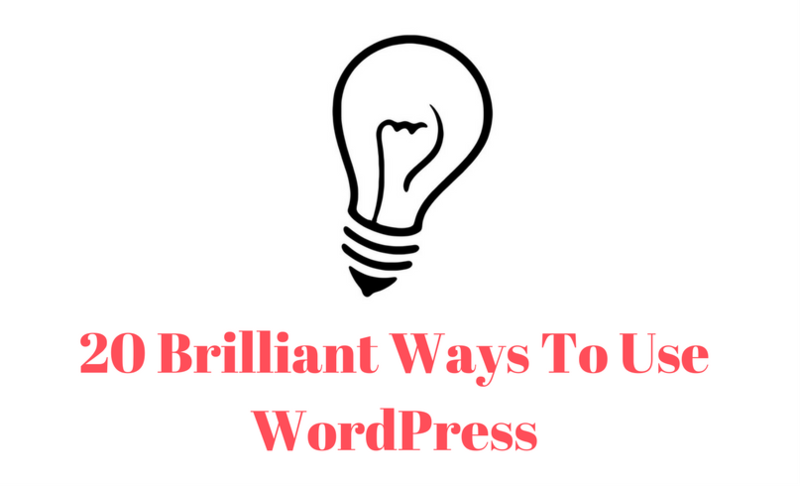 With endless possibilities WordPress is a major player in the market so why not let’s take a look at different and brilliant ways you can use WordPress. In addition to the most common uses such as blogging, magazines, portals, businesses, etc., we take it a step further and presents some areas of use that may not be that obvious, and you perhaps usually don’t think of. But as I mentioned earlier with WordPress, you can set up almost everything when it comes to websites. Shall we? Setting up a news website or portal with WordPress is very popular and common task these days, whether it be for small technology blogs to the major news sites such as The New Yorker, BBC America, TechCrunch and many more. There are both specific WordPress themes and plugins available to create an attractive news site. Check out some themes you can use to display and present news on your WordPress website. Why not set up your own Job Board website? Setting up a job board or listing with WordPress can be done easily with both themes and plugins. With a job board, you can help people to find work, plus you can also charge companies or employer (a small surcharge) to advertise jobs. If you are planning to launch a job board site, these plugins can be helpful and get you started. Wiki is Hawaiian for “fast; quick.” A Wiki can be described as a website that allows anyone to add, delete or revise content by using a web browser. The most well-known wiki is Wikipedia, which most people are familiar with. If you want to create your own Wiki website, there are a few different options to create a Wiki knowledge base using WordPress. But the most common ways is to use a theme or plugin. Here are a couple of themes to use to launch a Wiki. To create an event or conference website with WordPress is a great alternative because there are quite a lot specifically-designed themes and plugins for just this purpose. If your goal is to become professional event organizers for conferences, concerts, sports events, congresses and other events these WordPress themes can be of great assistance. Nowadays, it’s easy to build your online business with WordPress. The rise of online shops integrated into WordPress is much the WooCommerce plugin from WooThemes merit. WooCommerce powers over 37% of all online stores. With the automatic installation it’s easy to get started. The free eCommerce plugin is built to integrate seamlessly with WordPress. With WooCommerce you have the capability to sell anything on your website. bbPress is a plugin and forum software for WordPress that adds forum capability to your site. With bbPress, you can easily setup discussion forums inside your WordPress.org powered site. Forums are good old reliable tools to build online communities for both support or other issues. bbPress is free to use, is an open source forum software with thousands of contributors around the world. So why not set up your own forum? If you want to build any type of community website using WordPress there are of course tools for this purpose as well. With the BuddyPress plugin you can create any type of community website with member profiles, activity streams, user groups, messaging, and much more. Some examples of use are; Social network for your university, school or college, internal communication tool for a company, and focused communities for products & services. If you want to get creative, there are endless themes and plugins you can use for your WordPress website. What better way to catch your visitor’s attention than with photos, music or videos? So for those three niches I have chosen a couple of WordPress plugins that will ease your work in the entertainment industry. For pictures and galleries NextGEN Gallery is the most widely used plugin with over 15 million downloads. The YouTube plugin let you embed responsive videos, YouTube channel gallery, or playlist gallery. For musicians, I recommend the article – Must Have WordPress Plugins for Musicians, where you will find great tools to create a captivating online presence. The mobile market is huge today and almost everybody has a smartphone or tablet. Why not turn your WordPress website into an app? A service that does the job is AppPresser. AppPresser works through plugins and a theme, the same way you built your site and you can easily create a mobile app from any WP site and then publish it to the app stores. It doesn’t require ninja mobile app skills, just basic WordPress development. Sharing is Caring! Everybody basically using any form of social media today. Whether it’s Facebook, Twitter, Instagram or any other service to share information between family, friends or work colleagues. If you considering starting your own social bookmark site but thought it seems difficult, think twice. If you use any of the themes below you can easily get your own social bookmark website up and running and start sharing topics of your choice. Like to bid on items at auctions? Why not launch an auction website and let your visitors selling items? You can benefit from all sold items and make commissions from it. I have selected some WordPress plugins you can use to start selling stuff in a quick and easy way by setting up a professional auction website in style. Digital learning can be of great benefit to many people as they can study from home through online courses. Is it of your interest to start your own learning portal or put up a digital classroom there are both WordPress themes and plugins available. One of the most used and popular plugins are LifterLMS. With this learning management system, you can create and build and sell online courses, engage students and participants, add grades and much more. LifterLMS simply provides a comprehensive yet very user-friendly way of generating online courses. If you run a business, you know hard it can be to organize and structure your daily tasks as well as new, ongoing or older projects coordinated in one place, right? There are lots of different services and tools you can use online, but as you use WordPress, why not take advantage of it? There are of course themes and plugins to bring project management to your WordPress site. Here is a list of 3 most useful project management plugins. A well-known expression that you probably recognize is: Content is king. Which is absolutely true (in my opinion). Like all Internet users nowadays you and I are literally bombarded by content of variable quality every day. And it can be really difficult to choose good, quality content that provides value. If you want to create a website that brings together the best of the best, an RSS aggregator website could be a brilliant idea. With a WordPress plugins like WP RSS Aggregator (free), you can really kick start your site. Import, merge and display RSS and Atom feeds from the best websites and you have a comprehensive and great solution for gathering content of value. Don’t forget – Content is still king! The time when you send your resume via snail mail to employers is long gone. Nowadays, everything is made online, so even a resume with your skills and portfolio to attract employers. With WordPress, you can easily set up an resume or vCard website with both themes and plugins. There are plenty of them to choose from. In the list below you, find new WordPress themes you can use to create an attractive personal resume. Is there a city guide in your town? If not then it’s a perfect opportunity to create one. A city guide is a publication that lists various destinations, venues, and services within a particular city. A city guide is perfect for both longtime residents and newcomers to discover needed services such as health care, dry cleaning, and natural food stores. There are niche WordPress themes (of course) for this purpose as well. Check out a couple of them. Who doesn’t like to win stuff? In fact, I have personally gained lots of great prizes such as WordPress themes, plugins, subscriptions for various services in contests and giveaways. It’s easy to enter, usually, it’s about some kind of social interaction. A Like or a Tweet and you have a chance to win something. If you as a website owner also wants to implement contests and giveaways on your website there are WordPress plugins to ease the management of contests, or you can freely use any of these easy-to-use online services. As you can see there are tons of possibilities of creating something really cool and useful with WordPress. The twenty listed ways of using WordPress is only a small, small part of what is possible. So if you thought WP was only for blogs, these suggestions may come in handy the next time you start a new project. WordPress is a flexible CMS and with all the great accessories such as specifically customized themes, and plugins make it possible to launch almost everything. I would love to hear about your next WordPress project in the comments below! Peter Nilsson is the founder of WP Daily Themes & WP Newsify. He is a WordPress enthusiast and has been working with WordPress for years. He writes about topics such as WordPress, blogging, themes, and plugins on his blogs.